Proper maintenance of your vehicle is an important step toward ensuring your safety on the road. 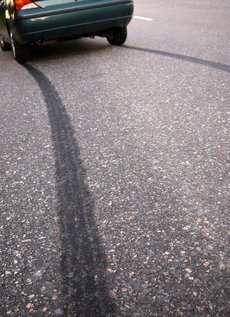 Tire failures at high speeds can result in vehicle rollovers, serious injuries and death. Below are five safety hazards to watch out for; the presence of any of these conditions can indicate that your tires should be repaired or replaced – before it is too late. Incorrect tire pressure compromises both the comfort and safety of your ride. Improper pressure affects braking, cornering, stability, mileage and tire life. Furthermore, tires that are not inflated to the proper pressure face a higher risk of catastrophic failure resulting in a serious accident. Low tire pressure causes increased friction and can overheat the tire, causing tread separation. The recommended tire pressure is always less than the maximum allowable pressure stated on the tire itself. Your vehicle’s recommended tire pressure can be found in the owner’s manual, or the label on the car’s driver’s side door, glove compartment or gas tank door. If the tread on your tires has worn down, you are at an increased risk of a blowout or hydroplaning accident. Additionally, worn tread may indicate a more serious problem, such as improper balance, suspension or alignment. Finally, tires with worn tread are more likely to be underinflated, affecting steering, braking and mileage, and causing further safety risks due to improper air pressure. If you often notice that one of your tires seems low, despite the fact that you have inflated the tires to the proper pressure, this could indicate a leak. There may be a small puncture in the tire’s tread, perhaps caused by driving over a nail, or it may be caused by a poor seal between the tire and rim or a damaged valve. These problems can often be repaired, rather than having to replace the tire. Ignoring the problem can lead to a sudden drop in tire pressure while on the road, which can result in a blowout or loss of control. Any budge, regardless of size, indicates that the tire’s integrity has been compromised and the tire should be replaced immediately. This could be due to an impact with a curb or pothole. When such a bulge occurs, the steel belts inside the tire have weakened and can no longer ensure safe operation of the vehicle. Care should also be taken to ensure that the impact that caused the tire bulge did not also cause damage to the wheel itself. If your tires are old or the vehicle has been immobile for a lengthy period of time, the tires may be affected by a form of “dry rot.” Regardless of how climate-controlled the storage environment is, tires that sit for extended periods will weaken over time until they are unsafe for travel. Similarly, old tires will show signs of degradation. You can identify this problem by examining the tire for small cracks in the tire’s sidewall. If any cracks are present, the tire should be replaced.